POLYETHYLENE JARS – We offer rigid, high density polyethylene wide-mouth jars with screw-on caps which are available in 5 sizes. They are excellent for storage of dry shellac flakes, hide glue, dry dyes and pigments, etc. You’ll find there are many uses for these containers in the shop or household. SIZES 2 oz., 8 oz., 16 oz. 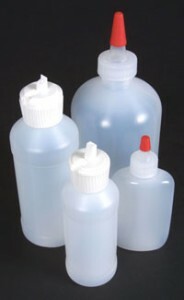 SQUEEZE BOTTLES – These “easy-squeeze” polyethylene round bottles with tapered, dispensing screw-type caps are the perfect containers for storing and dispensing liquid shellac to the shellac pad. Another suggestion for use (and a way to save money) is to buy glues, solvents, etc. in bulk and then store and dispense the product in these smaller containers. SIZES 2 oz., 16 oz. POLY “FLIP-TOP” BOTTLES – These bottles have an open flip-up style cap for easy dispensing and re-sealing of finishes, liquids, glues, stains and dyes. Solvent resistant high-density polyethylene makes for a shatter-proof bottle while allowing you to squeeze contents out if necessary. 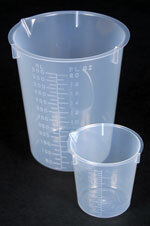 GRADUATED BEAKERS – These translucent polypropylene beakers are perfect for measuring small amounts of both liquids and dry powders. The large size on left is 600 ml (20 oz.) and the smaller one on the right is 100 ml (3½ oz.). Easy to clean and re-use. Will withstand 250° F and are corrosive resistant.